- won the Guitar World Magazine Readers Choice Award and was voted the "Fastest Guitarist of All Time." Over 440,000 votes were cast, in November 2011. Michael Angelo Batio has an advanced knowledge of music theory, having a deep understanding of complex scale combinations and time signatures which assist him in his compositions. He is best known for his technical mastery of the fretboard and his extremely fast picking and sweep picked arpeggios, and for his ability to play a double and quad guitar, using both hands to play. Michael Angelo Batio uses his signature pedals all the time at his clinic, concerts and master classes wherever at tour or at studio room. Enjoy the great effect sound brought to you by Michael Angelo Batio! 1- 3 different modes - echo, mod and normal. 3- Patented stop bar design on the pedal face to avoid accident move of buttons when stamping on the pedal. 6- Power consumption less than 20mA. 3 DIFFERENT DELAY OPTIONS IN 1 PEDAL. 3 modes- Echo/Mod/Normal. Easy to get different styles of delay sound in 1 pedal. 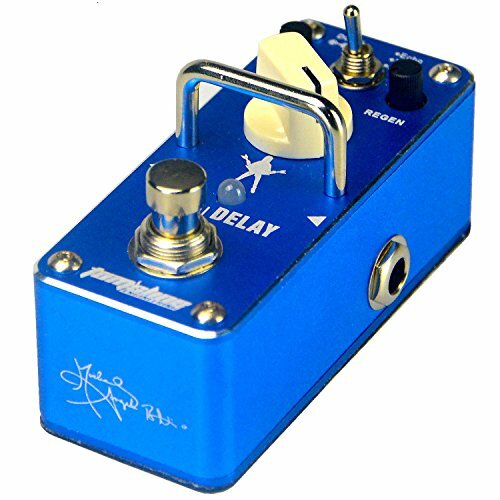 Enjoy and get much fun out of this little delay pedal. BIG RANGE DELAY. Endless sound repeat counts, super long delay time length max 838ms. Regenerate, Time and Level controls to get the ideal delay sound. The pedal keeps the sound clean without any noise. EXCELLENT BUILT UP QUALITY. Tiny footprint. Protection bar on the pedal top to avoid accident move of control knobs. Heavy aluminum case. Nano size, big sound. GREAT GIFT PACKAGE. The pedal is padded extremely well in the gift box. Comes with a MAB signature sticker and a logo sticker, and a pre-sized velcro! A MAB SIGNATURE PEDAL. Michael Angelo Batio - "Fastest Guitarist of All Time" signature and portrait left on the pedal.He uses this signature pedal wherever at his studio, concerts or master classes. Enjoy the great pedal and share with us at Aroma Facebook account.